Broadband Internet has extended our opportunities to share goods with others or borrow items that we need to use but do not have to own. Now we have well-organised businesses that match supply with demand. The most widely known forms of this sharing economy are accommodation and car sharing solutions, but the possibilities are unlimited. Followers of the lifestyle based on sharing have appeared in Hungary, too, but they are easily outnumbered by those who would try these new services if they knew where to find partners. This is the conclusion of eNET-Telekom’s latest “Report on the Internet Economy”. This time, the research was focused on the reception and proliferation of the sharing economy. If it’s everybody’s, it’s nobody’s? Experts have still not come up with an exact definition of what is called a sharing economy, but a significant group of the Hungarian Internet community is receptive to these old-new social consumption methods. And with a good reason, too. Sharing our goods, time, or work capacity in order to help each other is not a novel idea, but the Internet has immeasurably expanded the potential scope of such mutual assistance. In today’s “global village”, almost everybody is our neighbour and we can knock on their doors for help, provided that we know where to find the relevant online communities. The question is to what extent we take advantage of or even know about these opportunities. According to eNET’s survey conducted in August 2014, 23% of adult Internet users claim to reject the exclusive ownership of goods that we do not use frequently. For that reason, these people consider it a good idea to share occasionally used items with others. However, 22% hold opposing views, claiming that joint ownership only leads to problems. The majority stand somewhere between these two extremes, finding their own golden mean. Couch surfing could have been the first widely known example for the sharing economy. Even movie studios have noticed the community of people seeking free private accommodation online and offering their own homes in exchange, which further increased public awareness of the movement (which could in fact be called a lifestyle). But home sharing is far from unprecedented. Most adult Hungarian Internet users have stayed with relatives (78%) or close friends (58%) together with the home owners, without giving anything in return. In fact, almost 10% report to have stayed with people who were more or less strangers. Close friends and relatives generally provide accommodation as a favour. Casual acquaintances render this service less frequently, and if they do, the guests often contribute to the hosts’ expenses. Sleeping in a stranger’s home requires trust, but letting a stranger enter your living space is a matter of even more trust. Such trust may arise from knowing the other person, and belonging to the same community is another ancient source of faith. One in 10 Internet users would probably be willing to let another person contacted on the Internet use their room or apartment as a favour, provided that this is administered by a community that offers similar hospitality. In fact, three per cent have already let out their homes in this manner. If the transaction involved some financial gain, 14% would provide accommodation to strangers. On the other hand, others reject the idea of payment, insisting on a system based on mutual favours. Overall, about 20% of adult Internet users would probably be willing to share their homes with strangers met on the Internet (or have already done so). Even more people (26% of the sample) would like to be or have already been guests in this arrangement. The (mostly) non-profit nature is an important feature of this social market. Only a minority of the potential hosts would insist on money in exchange for hospitality. But a majority of the potential guests are not put off by the idea of sharing the host’s costs. 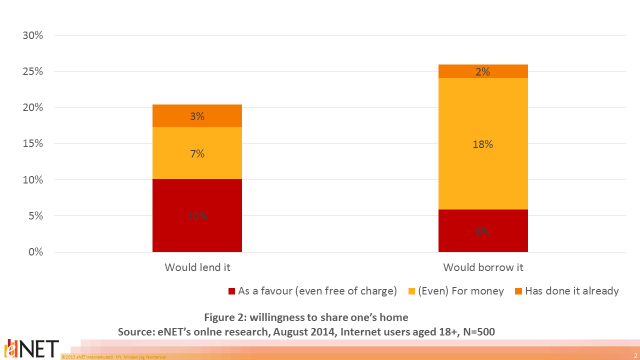 Despite the high willingness, only 13% of Internet users and barely one fifth of the interested persons know a home page where private individuals can offer their couches, rooms or homes to others as a favour. Most people spontaneously mentioned the website couchsurfing.com, and airbnb.com is also widely known. Some 25% of those who are aware of these sites have already used them to search for accommodation, and about 10% went there to offer their homes. While this is only a bit more than a third of respondents but all of them recommend that others should use these online opportunities to put other people up or accept the hospitability of strangers. Besides real estate, another classic example for the sharing of valuable but partly unused private property is a car. Four out of 10 adult Internet users have hitch-hiked, and almost the same number of people has stopped to pick up a hitch-hiker. Thanks to the Internet, third-millennium nomads no longer need to stand around by the side of the road in wind and rain; instead, they can make their travel appointments online. Nearly half of all Internet users know a home page or application that allows car owners to offer their seats to people bound for the same destinations. About 3% have used such solutions as passengers, and 2% as drivers. Car sharing is usually a paid business; giving money has been quite natural in conventional hitch-hiking, too, albeit not in Hungary but in some Eastern European countries. Experiences indicate that the future of such services is bright: each and every car sharing participant, whether driver or passenger, would gladly recommend this solution to others. One quarter of those who do not know such home pages would be willing to take passengers along in their cars as a favour, and only one third excludes that possibility. (The relative majority of the interviewees has no car or does not drive.) But if the passenger contributed to the costs, one in three even within this latter group would consider driving strangers along. Overall, more than one third (35%) of those who do not know car sharing sites would use the opportunity to share their travel time (and maybe travel costs) with strangers. Some 37% of those people who do not know car sharing services would get in the car of a driver who is a stranger apart from the car sharing connection and would contribute to the travel costs. A mere 5% rejects paying for hiking initiated online. Sharing is the future (too)? It is often claimed that modern life kills natural communities. But actually the Internet seems to allow people to reinforce their weakened networks of favours. More and more web sites and underlying communities appear and blossom that offer solutions to everyday problems such as the need for a car, accommodation, a good book, or a pair of skis. The sharing economy is one potential answer to both individual and global issues in general, and to the scarcity of personal and communal resources in particular. People have always resorted to similar solutions but broadband Internet provides possibilities that were unheard before.